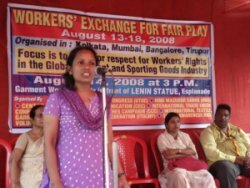 The Center for Education and Communication (CEC) in India organized an event to better engage sportswear workers in the Play Fair 2008 campaign: a Workers’ Organisers Exchange Programme. This exchange brought together workers' organisers from across Asia to share organizing experiences and discuss strategies. The event was held August 13-18 at various locations in India. 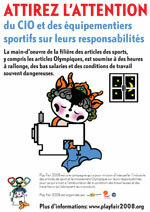 Representatives of J.O. Propres, the 15-organization coalition running the Play Fair 2008 campaign in French-speaking Belgium, were out in full force at the Esperanzah world music festival August 1-3 in Abbaye de Floreffe, Belgium. 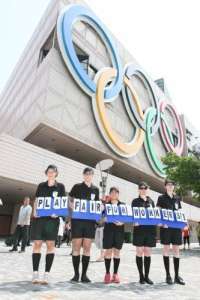 Over 8,000 people signed onto a Play Fair petition directed at the Belgian Olympic Committee, while supporters took part in a simulated 12,000 KM bicycle race to Beijing and experienced the production of Olympic flags in a sweatshop. 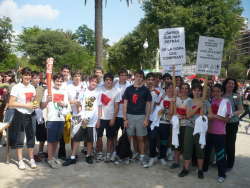 During July Play Fair supporters organized activities throughout Spain, including in Barcelona, Bilbao, Zaragoza and Pamplona, to bring the 2008 campaign in that country to a close.